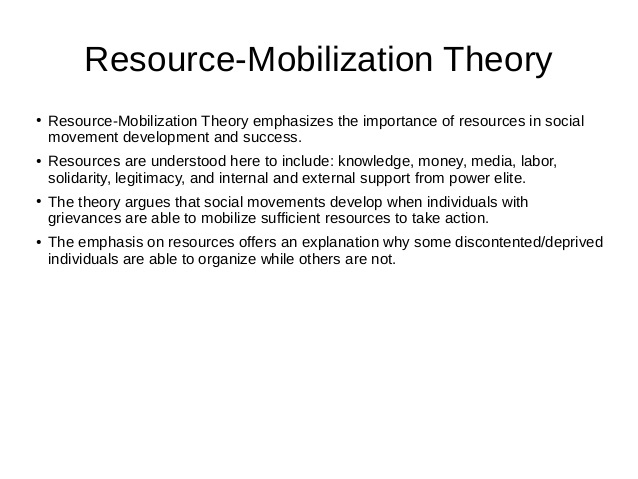 The resource mobilization theory is a major sociological theory that emerged in the 1970s in the study of social movements. It mainly emphasizes on the ability of members of a movement to acquire resources and mobilize people towards achieving the goals of the movement. For people to be recruited and remain committed to a movement, then its issues must be presented or rather “framed” so that they can resonate or fit with the feelings, desires and beliefs of potential recruits (Blackwell, 2015, p.450). This theory views social movements as rational social institutions that are created and populated by social actors whose goal is to take a political action. Resource mobilization theory has been able to study the conditions necessary for collective action to occur in the society for several decades now. Most authors have taken an interest in characteristics of organizations that reward members sufficiently to act collectively. McCarthy & Zald (1977) have been able to take part in this as well. McCarthy and Zald’s Resource mobilization theory builds from the insights of Mancur Olson in many ways. Mancur Olson introduced to us what has come to be popularly known as the “free-rider problem” which is the predisposition of individuals to gain from collective action even without participating in it. This also brings into discussion the concept of selective incentives which are private goods availed to people irrespective of whether or not they contribute to a collective good. These incentives can either reward contributors or punish those who do not participate. According to Olson, groups of people with common interests can be expected to act on behalf of their common interests as much as single individuals can be expected to act in the place of their personal interests (Blackwell, 2015, p.474). He further states that unless there’s coercion, a special device to encourage people to act in their common interest or the number of participants in a group is small then rational, self-interested individuals will not act to achieve either their common or group interests (Blackwell, 2015, p.480). This means that even if all people in a large group are self-interested and rational, and would benefit if they were to act to achieve a common objective, they would still shun working voluntarily to attain that mutual interest. Olson is opposed to the widespread view that is common in all social sciences that groups tend to further their interests. There’s also a common assumption that groups act in their self-interest simply because individuals do. However, there’s paradoxically the logical possibility that groups that are composed of either irrational or altruistic people may at times act in their group or collective interests. Olson firmly believes this logical possibility is usually of no practical importance and therefore it’s apparent that the customary view that groups of individuals bearing common interests are likely to further these shared interests has little if any merit (Blackwell, 2015, p.481).